Carport – 20′ x 12. 20’L x 12.6’W x 9.2H. Heavy duty galvanized finish. 220 gram Polyethylene + UV protection, waterproof. Grey (top); White (Back). Main Pole: 1.65″x 1.25″ Supporting Beam: 1. 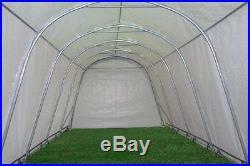 Carport, Portable Garage Outdoor Canopy. 218 pounds (heavy duty). Strong 220 gram/m polyethylene cover with UV protection. Chemically heat-bonded polyethylene cover with enhanced quality weave, rip-stop, waterproof. High quality, rust & corrosion resistant galvanized steel framework. Double zippered front panel and rear panel. Ratchet tie-downs Tensioning System provides simple installation while keeping cover tight to frame. Easy and fast to set up. All necessary hardware included. Full instructions and care manual. Description Super heavy-duty & waterproof with a commercial grade polyethylene cover, this carport protects your car or boat from the worst elements. The double zippered front door and back door completely enclose the carport. The carport is equipped with 1.65″x 1.25″ oval shape galvanized steel frame made to last a lifetime. Packing Information Total Weight: 218 pounds packaged in 2 boxes 1/2 53″ x 19″ x 9″ 106 pounds 2/2 66″ x 12″ x 7″ 112 pounds What’s included? Tent frame, top, sidewalls and accessories Safety notes We recommend that you anchor your tent in even the calmest weather conditions using a combination of tie down kits, ground bars and heavy duty pegs. Auger Anchors – Dirt/Gravel/Asphalt Easy Hook Anchor – Dirt/Gravel/Asphalt Cement Wedge Anchors – Cement. Damaged or missing parts must be claimed within 14 days. Orders paid via eCheck (Debit Card) will take 3 to 5 days to clear. States and Canada (for certain items). All items are brand new. Within 14 days from receipt of your item we accept defective item return. After 14 days, we will provide parts, replacement or repair service. Any item that does not meet the above conditions is not eligible for a return. Make sure we authorized your return. All e-mails will be responded to within 12-24 hrs (except weekends or holidays). Please check your spam folder if no response from us. I have sent many emails. Why haven’t I received a reply? How long does the fabric last? Fabric lifespan is directly related to the usage, location and the physical elements the canopy is exposed to. A tent’s biggest enemy is UV radiation (just like your skin). Do I need to anchor my canopy to the ground? The canopy must be anchored down to the ground with proper stakes. The actual number of stakes and the size of them will vary depending on what size of party tent it is, how much wind load they may be subjected to and the length of time they will be set up. There are other things that can be used depending on the situation. Auger Anchors – Dirt/Gravel/Asphalt. Easy Hook Anchor – Dirt/Gravel/Asphalt. Cement Wedge Anchors – Cement. Do canopies come rated for wind or snow loads? Because canopies are not engineered buildings they CAN NOT be wind or snow rated. 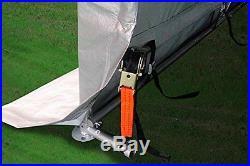 Anchoring the canopy securely is critical to wind resistance or minimize the impact from snow. If extremely high winds or storms are predicted the structure should be dismantled and stored. Keeping snow off the roof area is strongly recommended. Will repair or replace the defective parts to the original purchaser. Warrants only to the original purchaser that its products are free from defects in material and workmanship. Though our canopies are highly resistant, we cannot provide guarantee against any type of weather related incidents due to acts of nature, i. Hurricane, tornado, wind, flood, snow, wind driven debris, etc. The natural breakdown of materials that occurs inevitably with extended use e. Ultraviolet (UV) light damage on tents, exhausted zippers. Abuse, accident, alteration, modification, tampering, vandalism, negligence, misuse, abrasive contact, faulty installation lack of responsible care or if affixed to any attachment not provided with the shelter. Damage to contents of canopy any person or property excluded. Normal and foreseeable wear and tear. Improper installation according to the instructions provided. 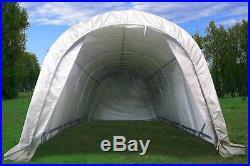 Canopy has been manufactured for use as a temporary structure. The customer must incorporate his own good judgment, common sense & knowledge of local conditions with the installation instruction guidelines. The customer is responsible to anticipate weather severity for proper time and method of construction, appropriateness of product for the intended site as well as evacuation or disassembly details. 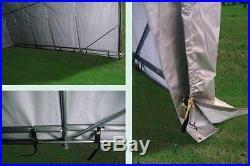 The canopy tarp I received is 2 to 3 inches shorter on each side… What is a “Cut Size”? The cut size is the industry’s standard way to measure. A 10×20 can be a Approx. 9’8″x19’10”. Do not worry; the tarp will still fit the canopy. It’s out of our control. If you receive all the packages in that time frame, it’s normal. Can I track my item? What if my item arrives damaged? When you receive your package, please check it carefully. We are here to help. We will gladly assist you. Our mission is to supply customers with better quality products and services. Your satisfaction is our highest priority. The item “SALE $$$ 20’x12′ Carport Garage Storage Canopy Shed Car Shelter Grey/White” is in sale since Wednesday, April 05, 2017. This item is in the category “Home & Garden\Yard, Garden & Outdoor Living\Garden Structures & Shade\Awnings & Canopies”. The seller is “wpic-bestdeal” and is located in McKinney, Texas. This item can be shipped to United States.